Travel to the place and time of St. Paul and unearth the beginnings of Christianity. Specially designed for the Christian traveler and alike. Some of the highlights include exploring the cave churches in Cappadocia, walking in the underground city of Ozkonak where early Christians lived for months at a time undetected and instead of just hearing from the pulpit “a reading from St. Paul to the Ephesians,” sitting in the same theater in Ephesus where he preached and visiting the seven churches of Asia Minor. B=breakfast, L=lunch, D=dinner. Where indicated. Upon your arrival in Ankara, the capital of Turkey, you are met with a friendly "merhaba" (hello) and escorted to your hotel. Freshen up before meeting your guide for an orientation about following in St. Paul's footsteps. 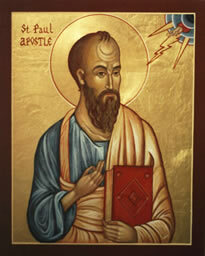 Born in Tarsus, St. Paul traveled extensively through southern and western Anatolia spreading the word of Christ between 45 and 58 AD. Finally, break bread together at a welcome dinner. Before you begin your pilgrimage, you'll get a sense of this modern city's ancient past as you visit the Museum of Anatolia Civilizations. Ankara's history and that of the surrounding area dates back to the Bronze Age. See many remnants of that past and the glories of the Hittite Empire before driving on to Cappadocia's seemingly desolate landscape. You may feel as if you have reached the lunar landscape, as you see the fantastic shapes that have resulted from the wind and the rain on Cappadocia's craggly surface. Today, you will visit the ancient village of Zelve. Then, see how early Christians utilized their resources and added to the beauty of nature's physical creation by paying homage to their religion. Explore some of the many cave churches still to be found in the Goreme Valley. Looking merely like the entrance to the cave from the outside, once you enter you see colorful frescoes created by the early Christians depicting their beliefs from the 7th through the 13th centuries. Kizilcukur Valley offers a rich variety of pinnacles, scattered around a park like scenery. In order to escape persecution from invading Roman armies during the 7th century, Christians built complete underground cities where they were able to live for months at a time undetected. They were so well hidden from the surface that many went undiscovered until the 1960s. This morning, you'll visit the underground city of Kaymakli, which extends beneath the surface to an underground world that includes wine cellars, chapels, schools, stables and tombs. Reach Tarsus before sundown. What better place to begin to truly walk in the Steps of St. Paul than in his birthplace! Begin your day with a visit to the cave where St. Peter first celebrated the mass near Antioch. The base from which Barnabus, Paul and Peter began their preaching, Antioch was also a center of monastic life. The impressive collection of mosaics displayed in the Archeological Museum are arranged according to where they were found. Together with the artefacts from the Paleolithic Age up till the present day, this museum will definitely be one of the highlights of the trip..
DAY 8. Konya/Antalya (BLD) A beautiful full day drive via Antioch of Pisidia-Yalvac- through the Anatolian plateau to Antalya, rising from the Turquoise depths of the Mediterranean. It was here that St. Paul preached, Hadrian ruled and the local timber was used to build ancient fleets. DAY 9. Perge/Side/Antalya (BLD) A full day to visit the many nearby Greco-Roman cities of antiquity. Begin in Perge where a scrape of your shoe reveals the same mosaic walkway St. Paul must have strolled on, to reach the theater where he preached. Next visit will be to a Roman Theater that is one of the most intact of it's kind... Aspendos. From the uppermost seat, Architect Zeno whispered to the local rulers inspecting the theater, which made them appreciate the value of this 2nd century work of perfection. This afternoon, explore the recently excavated theater of Laodikea (Denizli). Then on to Hierapolis, the home of St. Philip the Evangelist, to explore the necropolis, churches and baths. Nearby, enjoy the view of Pamukkale's cascading tiers of white limestone. Visit the site of Colossae, that never underwent an excavation. In Byzantine art, the theme of the Miracle of the Archangel Michael at Kona is intimately interlocked with the site. Today you'll be able to visualize a trinity of Biblical references from visiting the cities of Philadelphia and Sardis, where St. Paul preached, to staying in the city of Smyrna (Izmir), which St. Paul praised for its peoples' faithfulness. Visit the church of Polycarp. "There are no gods made with hands" are the words of St. Paul. Sit in the theater in Ephesus where St. Paul preached these very words which incited riot by the blacksmiths who felt this patriarchal, upstart religion was a threat to the worship of Artemis - the Mother Goddess, and to their business, as well. Stroll along the marble roads past the Library of Celsus and Hadrian's Temple. Visit the Basilica of St. John and the last earthly home of the Virgin Mary. The 3rd Ecumenical Council met in the Church of the Virgin Mary in Ephesus in 431 AD to establish in writing some of the major principles of Christianity - also providing the first written record that Mary had lived the last years of her life in Ephesus. Visit Thyatira (Akhisar) known for its guilds of artists in the time of St. Paul. Then, on to Pergamum, the rival of Ephesus in the field of commerce and of Alexandria in the fields of learning and arts. Home to the famous physician Galen, you will see the remains of the great library that once housed over 200, 000 scrolls and the restored theatre built into the hillside that seated 10, 000, as well as the red court of Pergamum (also known as the red church). Continue on to Bursa. Visit a masterpiece mosque, that earned its name - Blue Mosque, with its 21000 mosaic tiles that decorate the interiors. Walk among the obelisks that once stood in the spina of a very large hippodrome. Continue to St.Sophia, that is probably one of the greatest and earliest christian edifices, to see pieces of art that one can not observe elsewhere. Last visit will be to the Topkapi Palace. Offering a rich display of artefacts from the Ottoman period, and its many chambers where sultans' resided for centuries, this great palace is located on a peninsula with great views of Istanbul. End the day at the Grand Bazaar, with an opportunity to barter for kilims, carpets, leather, jewelry, at its 3000 shops, lined on both sides of the labirynth-like galleries. Visit the Chora Museum , where the lives of Mary and Jesus are depicted in colorful mosaics and frescoes of this once important Byzantine Church. Feel the oriental essence of spices at the Spice Market, and finally bid a leisurely farewell to Istanbul with a cruise on the Bosporus.